I want to start this post off by saying I HATE WINTER. Unfortunately for me…I live in the snow belt. Sigh. Yes, I know…it’s ONLY the beginning of December but I am ALREADY sick of winter! I don’t like being cold and I hate snow! 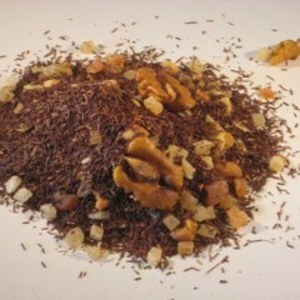 So, when I received this SUMMER SUNRISE Flavored Black Tea from Joy’s Teaspoon – I was HAPPY for more than one reason! I was also excited because I found out that Joy’s Teaspoon is from Las Vegas! I LOVE VEGAS! I have been there 3 times so far! PLUS last year The World Tea Expo was in Vegas. 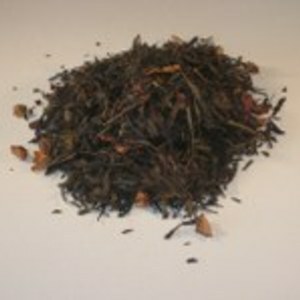 I heard for 2011 the World Tea Expo will be held in Las Vegas yet again! 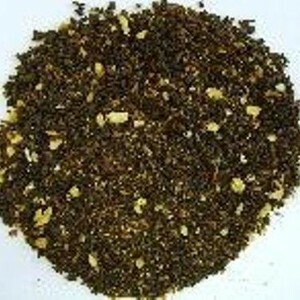 I haven’t been to the World Tea Expo but I would LOVE to go someday! In the meantime…I will enjoy one of Las Vegas’s Tea Companies here in my home! I guess I can make the connection with the name of this because it DOES remind me of a Summer field or meadow! The pretty aroma and feeling it gives you right off the bat! 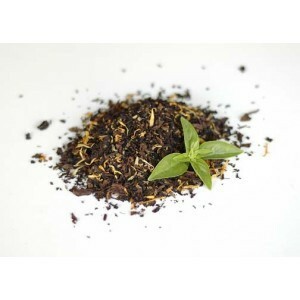 The taste is of black tea, basil, and a hint of lemony goodness…but only a hint. So if you are afraid of lemon – you might like this because it is subtle. If you are worried about the Basil – don’t be! It adds to the over all cup but isn’t over powering. This is nice…if you get the chance…try it! Green tea with a touch of cinnamon and apple makes this a satisfying cup. A great choice over ice in the summer too!. For me…this has the PERFECT amount of both the cinnamon and the apple and they are equally yummy. 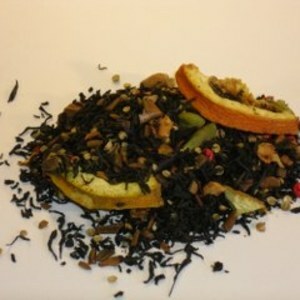 The semi-sweet and juicy green tea is the focus of this offering from Souvia and I just think it’s genius! Souvia…I am a fan of your Harvest Moon. Plain and Simple! Thank you! I have been seeing SANDS OF THYME mentioned online by a few fellow tea freaks lately so when we were able to try some of the Sands of Thyme Teas I was more than happy! I LOVE their shop name on Etsy! I just have to point that out! So far one of my favorites is their Chai Indienne. It’s light on aroma but not on taste! The spices are JUST RIGHT for me! The cinnamon is a little bit stronger than the ginger. The cardamom and cloves are in there too – as well as the black pepper. I appreciate these specific ingredients not being too strong. I can taste floral notes as well! The rose petals are a nice touch. The vanilla is noticeable in the middle of the sip and more-so as it cools. I applaud the vanilla in this case – it helps with the other spicy spices and really added to the mix of flavors! This is a good chai, indeed! You’ll take a mini vacation as this refreshing blend sweeps you off to a tropical isle. Smooth green tea with coconut and pineapple in the the classic concoction. The sweet and juicy green tea and the super juicy pineapple are in the forefront and the coconut has a great deal of flavor too! 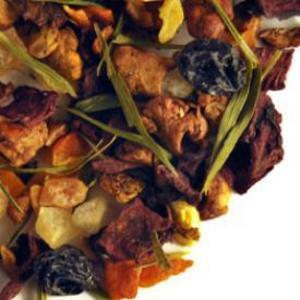 This Sencha Pina Colada Tea from Souvia is one you won’t want to miss! I had a cup hot and another cup cold and LOVE both! If you like flavored greens and like pineapple you must try this! This exceeded my expectations and was a wonderful surprise!